A Russian Proton rocket launches three new Glonass-M navigation satellites that later crashed into the Pacific Ocean after lifting off on Dec. 5, 2010 from Baikonur Cosmodrome in Kazakhstan. Russian President Dmitry Medvedev has formally reprimanded the chief of his country's national space agency and fired two other high-ranking space officials over the loss of three state-of-the-art navigation satellites in a botched rocket launch earlier this month. The decision, announced by the Kremlin today (Dec. 29), comes after an investigation into the Dec. 5 launch failure of a Russian-built Proton rocket carrying three new Glonass-M navigation satellites. The satellites never reached orbit. Instead, they plunged back to Earth and crashed in the Pacific Ocean north of Hawaii. 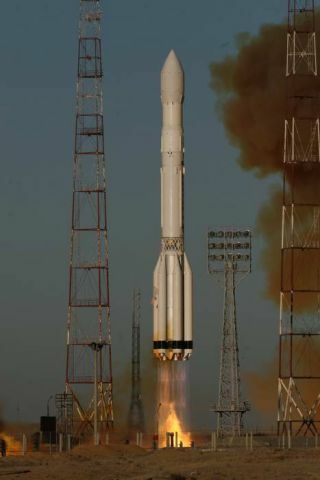 A follow-up investigation traced the failure to an embarrassing mistake: Technicians apparently loaded the Proton rocket's Block DM-3 upper stage with between 1,000 and 2,000 kilograms more fuel than planned, which sent the booster off course. According to the Kremlin statement, Medvedev fired Viktor Remishevsky, deputy chief of Russia's Federal Space Agency, and Vyacheslav Filin, vice president and deputy chief of the rocket manufacturer RSC Energia, after receiving the report on the launch failure investigation. The two space officials were fired "for the errors made in the calculations for refueling the vehicle's Block DM-3 upper stage," according to the statement. Medvedev also issued a formal reprimand to Anatoly Perminov, chief of Russia's Federal Space Agency (also known as Roscosmos). "Roscosmos will take additional measures to reinforce disciplinary measures," the statement read. Soon after the launch failure, Russian investigators traced the cause to the overfueling blunder and cleared the rest of the Proton rocket of any concern. The Proton rocket fleet successfully returned to flight on Monday (Dec. 27) with the launch of a Ka-Sat broadband communications satellite for Eutelsat. Russia's Glonass-M satellites perform a navigation service to Russian civilian and military customers similar to U.S. global positioning system satellites. The satellites each weigh just over 3,000 pounds (1,415 kilograms) at liftoff and are designed to last seven years in orbit, according to the satellite fleet manufacturer Information Satellite Systems Reshetnev Co. There are 26 Glonass satellites in orbit, with two reserved as spares. The satellite constellation is split into three groups of eight craft to provide global coverage. A new series of Glonass satellite, the Glonass-K series, is currently in development, Russian space officials have said.